The first half of Alice Rohrwacher’s Happy As Lazzaro unfolds in a sharecropping tobacco farm known as Inviolata, its name (literally, “inviolate”) redolent of a place pure and untouched, sheltered from the ravages of time. When the film opens, an electric light bulb—that enduring marker of human progress—is being shuttled through a house in which there are evidently too few. Though it’s soon clear that we are in a secluded pocket of rural Italy, a viewer would be forgiven for mistaking precisely when this tale takes place. And that’s no accident, since the Italian director’s beatific third feature (which took the Best Screenplay award at Cannes, alongside Jafar Panahi’s 3 Faces) fully evokes a sense of temporal dislocation—a feeling of being unstuck from the flow of history—and in doing so, clarifies our very relationship to modernity. Overseen by the Marquise Alfonsina de Luna (Nicoletta Braschi), known widely as the “Queen Of Cigarettes,” the workers of Inviolata toil in conditions for which “backwards” would be a generous descriptor. Exploitation is the norm, and the title character (newcomer Adriano Tardiolo) receives the brunt of it. With an innocence that goes far beyond childlike, Lazzaro exists as a kind of “holy fool” of the Orthodox tradition. In an early scene, cries of “Lazzaro!” ring through the tobacco fields, as his fellow peasants offer him extra work that he’s only too happy to accept. “I exploit them, and they exploit him,” the marquise tells her lanky, lazy son, Tancredi (Italian pop singer Luca Chikovani), who belatedly arrives on the plantation against his will. With his shock of blond hair and even more shocking set of modern belongings—among them a Walkman and a flip phone—Tancredi jolts our perception of what we have just seen. For though the practice of sharecropping was officially outlawed in Italy by 1982, the dance hit “Dreams (Will Come Alive),” which Tancredi listens to at one point, firmly plants the film in the 1990s. The situation takes inspiration from a real-life scandal. 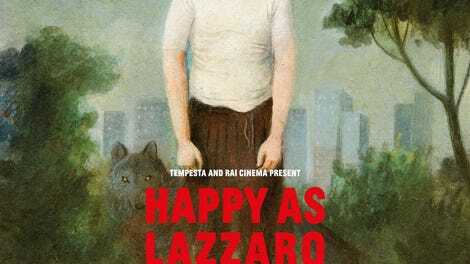 But far from a ripped-from-the-headlines drama, Happy As Lazzaro unfurls more like a fantastical, folkloric fable. Here, Rohrwacher extends the fully inhabited naturalism of her last feature, The Wonders, while retaining the overtly religious symbolism of her debut, Corpo Celeste. The resulting amalgam is as beguiling as it is, well, wondrous—all the more so for how unassuming and easygoing it feels. As shot by Rohrwacher’s regular cinematographer Hélène Louvart (Beach Rats), the film’s grainy 16mm images possess an ethereal, almost otherworldly quality. Likewise, its handheld camera movements aren’t wedded to any pretenses of strict realism; they’re as free as the winds (and wolves) that howl through its detailed soundscapes. 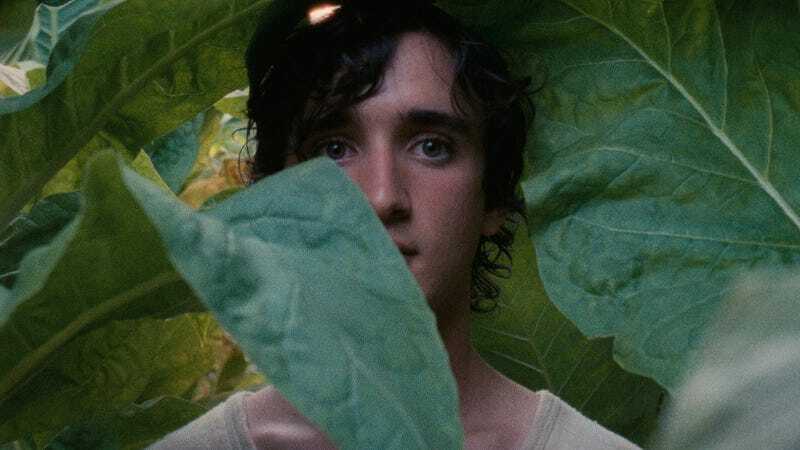 With Lazzaro at the film’s center—offering only goodness and generosity, even as his wide-eyed, glassy gaze catches all forms of harshness and contempt—dramatic urgency practically disappears into vaporous wisps. Eventually, the capricious Tancredi takes a passing interest in Lazzaro, just as a spoiled child would a casual plaything. Fueled by long-standing resentment toward his mother, he stages his own disappearance and solicits Lazzaro’s help to do so. Apart from precipitating the discovery of the marquise’s illegal sharecropping practices, this leads to a disarming midpoint rupture that’s emblematic of Rohrwacher’s sly, sure hand. (A particular moment, best left for discovery, elicited a collective gasp from the audience during its Cannes premiere.) Suffice it to say that what follows is uniquely enchanting—a disarming movement into well-trodden territory that’s somehow rendered alien and new, as if one were seeing things for the very first time. Although Happy As Lazzaro’s rustic rhythms are far from, say, the monumental ambiance of Luchino Visconti’s 1963 period epic The Leopard (inevitably recalled by the name Tancredi), Rohrwacher is similarly concerned with the unending march of modernity in her native country. The script certainly doesn’t shy away from expansive gestures, but Rohrwacher’s deceptively gentle approach smuggles them in, transporting the viewer in ways that only seem to register in retrospect. The film isn’t entirely free of didacticism or easy sentiment, but a sense of delayed recognition is what makes it such a knotty experience. Poised somewhere between despondency and hope, its conclusion suggests that, unable to see pure goodness even when it’s right before our eyes, we unwittingly snuff it out. Yet that goodness will endure—and it will outlast us.